Renée Baker is a violinist/violist, composer, and improviser who has been at the extreme forefront of creative/avant garde music. She has performed and recorded with Nicole Mitchell’s Black Earth Strings, Karl E. H. Seigfried’s New Quartet and Galaxy String Quartet, the David Boykin Expanse, Orbert Davis, George Lewis, Mwata Bowden, the Great Black Music Ensemble, the Chicago Jazz Philharmonic and the Chicago Jazz Orchestra. She is a member of the Chamber of the Association for the Advancement of Creative Musicians (AACM). Founder and Artistic Director of the Chicago Modern Orchestra Project, Ms. Baker also leads the Mantra Blue Free Orchestra (performing her own work), and is principal violinist and Artistic Director of the Chicago Sinfonietta Chamber Ensemble. 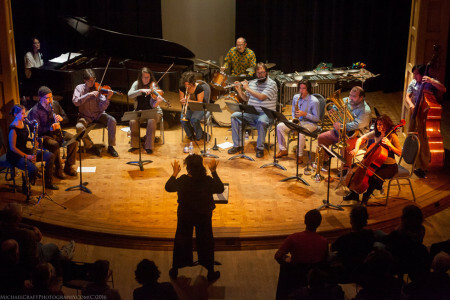 For this concert, Ms. Baker leads an ensemble of twelve of Seattle’s outstanding improvising musicians performing works combining conduction, graphic scores, and standard notation: Ivan Arteaga (saxophone), Heather Bentley (viola), Samantha Boshnack (trumpet), Greg Campbell (percussion), Isaac Castillo (bass), Clifford Dunn (flute), James Falzone (clarinets), Beth Fleenor (clarinets), Tiffany Lin (piano), Tari Nelson-Zagar (violin), Greg Powers (trombone, didjeridu), Gretchen Yanover (cello). Presented by Nonsequitur and Earshot Jazz Festival. Interview with her at Second Inversion.